Alissandra Aronow skates with Collin Brubaker in 2016. Alissandra Aronow became fascinated with competitive skating while watching her mother, Marjorie Fisher, an adult ice-skating student, realize a lifelong goal. As a 4-year-old looking on from the sidelines, Aronow could hardly wait to try the sport and soon was given pink plastic skates. Although drawn to lots of athletic activities, Aronow ranked skating as her favorite. She loved the artistry and the ability to propel herself in different ways by taking to the rinks. With a stick-to-it attitude and lessons at the Arctic Edge of Canton, Aronow made notable achievements in figure skating and joined with Collin Brubaker to win first place in sectional competitions showcasing ice dancing. Some 20 years after beginning her career, Aronow recently decided it was time to move on to other interests for herself but not away from the opportunity to inspire young people with the ice dreams she has held so close. An art history major at the University of Michigan, Aronow has agreed to serve as a co-chair of the Champions Committee now helping to establish Figure Skating in Detroit (FSD). The program, which is adapting lauded aspects of Figure Skating in Harlem (FSH) for the Motor City environment, connects the sport to academic achievement and personal development. In its first year outside New York, the expanded effort is gearing up to include 300 girls between the ages of 6 and 15 and use the Jack Adams Arena in Northwest Detroit as its base. 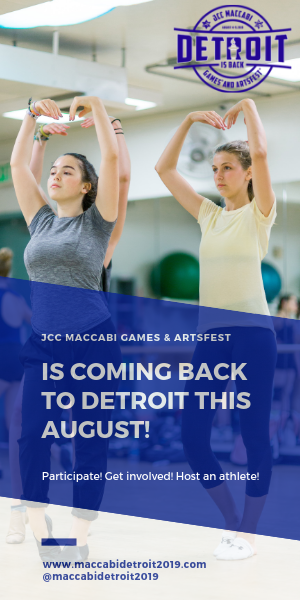 The program will also use the rinks at Campus Martius and the Detroit Skating Club in Bloomfield Hills and, upon completion, the new Little Caesars Arena. “I really wanted to be involved,” says Aronow, who attended Cranbrook and took religious classes at Temple Israel. “The program combines three of my biggest passions: figure skating, childhood development and Detroit. Aronow was introduced to the city skating program by her aunt and uncle, Julie and Peter Cummings, community leaders who directed her to Sharon Cohen, founder and CEO of Figure Skating in Harlem. Figure Skating in Detroit co-chair Meryl Davis performed with Charlie White at the program announcement. Cohen, who never had been to Detroit until thinking about cities that could benefit from skating opportunities, has visited the area a dozen times since Detroit was in consideration, and she will continue her local commitment. 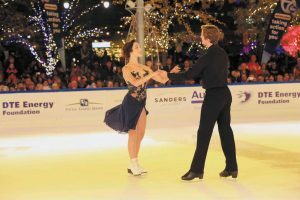 “We looked for criteria to be in place for our model to be successful,” says Cohen, who has been a United States Figure Skating (USFS) double gold medalist in figures and freestyle and a gold level ice dancer. 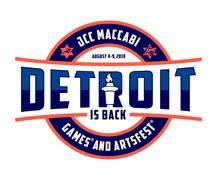 “Of the seven cities we looked at, Detroit met all of them. Cohen launched FSH 20 years ago, after a chance meeting with a group of East Harlem girls who were eager to learn how to figure skate. “Over the years, I learned that when you provide a safe space and you give young women an opportunity, they just grab it,” says Cohen, whose program has been directed toward girls of color. “It was so profound to see the girls grow and change before my eyes. Cohen easily describes the diverse subjects that have been part of instructional experiences as related to skating performance — health, science, communication, music, finances and leadership. 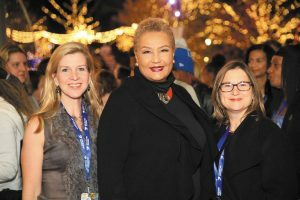 Geneva Williams, who has held executive positions at United Way and City Connect, is heading up administration of FSD. She was introduced to Cohen by a friend who is principal of a Harlem school working with FSH. “We will be introducing our program through a series of community workshops in the spring and then a summer camp,” Williams says. “In the fall, we’ll have afterschool sessions with on-ice instruction and off-ice conditioning and instruction. FSD has partnered with the Michigan Women’s Foundation, which is making office space available in Downtown Detroit, and there are opportunities for volunteers to serve as mentors, tutors and varied career role models. 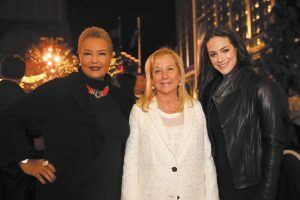 Besides Aronow, the Champions Committee includes Meryl Davis and Charlie White, Olympic gold medalists; Denise Ilitch, president of Ilitch Enterprises; and Peg Tallet, chief community engagement officer of the Michigan Women’s Foundation. “Growing up in a family that is so focused on creating a positive impact was a motivator in my involvement,” Aronow says. “My late grandparents, Max and Marjorie Fisher, were the most giving and loving people I have known. They taught me to dream bigger, do more and be a leader. They worked to create justice and improve the world. A fundraiser to benefit Figure Skating in Detroit is being planned for Monday evening, Feb. 27, at the Cube in the Max M. & Marjorie S. Fisher Music Center in Detroit. For information on supporting Figure Skating in Detroit as a donor or volunteer, visit figureskatingindetroit.org.